Reprints the entire Mean Team story from 2000AD plus the follow up series 'Survivor' starring Henry Moon. In the year 2886, Death-Bowl is the most popular sport in the galaxy - men and machine pitted against each other in a brutal gladiatorial contest! 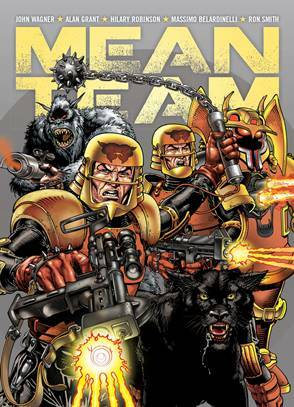 Mean Team is another face-smashing, limb-tearing, gut-busting classic from the pages of legendary British comic, 2000 AD. In the history of the game, 'Bad' Jack Keller and his squad of hardened killers, known as the Mean Team, have racked up more wins than anyone else - their incentive being the hope of freedom! But team owner Richman Von is not so eager to lose him champions. So Jack, Amok the alien, Beester, the robotic Steelgrip and Henry Moon - the telepath trapped inside the body of a panther - will have to escape the arena and bring their battle out into the world! Written by 2000 AD legends John Wagner (Judge Dredd), Alan Grant (Batman), Alan Hebden (Meltdown Man) and Hilary Robinson (Zippy Couriers) and featuring the breathtaking, mind-blowing artwork of Massimo Belardinelli (Ace Trucking) and Ron Smith (Judge Dredd), this complete collection of violent, action-packed adventure makes Rollerball look like a kiddie's tiddlywinks contest!